I came across this how-to article on terrarium-making in the Jakarta Post. 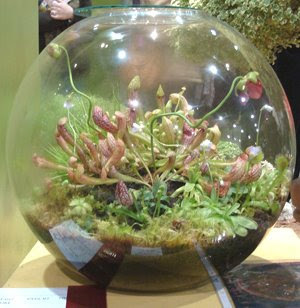 I absolutely love the photos- especially the globe terrarium with pitcher plants. A bog terrarium would be great fun and maybe gnats wouldn't be as much of a problem? Zeolite sand consists of volcanic minerals that absorb air from the surroundings. The compost, which Anie says should be made from plant not animal waste, works as a natural fertilizer. Your posts inspire me! Inspiration is the first step. Second step - I have tiny ferns, growing from seeds which fell from the hanging fern basket last year. Now, I need to look for a glass container. I think I'll be ready for this project in fall. If I make it, my first "Thank you" will be to you! i've heard of zeolite clay; i wonder if it's the same as this zeolite sand? the stuff i saw was being sold alongside other types of cosmetic clays (for face masks and such). Very nice terrarium, looks almost cosmic.. I can't imagine American Pitcher Plants doing too well in a terrarium... They like full sun which was a surprise to me, but maybe with a strong light source (low heat), they'd do fine. It is a very pretty planting though, so now I'm conflicted. Yeah I have heard the same about the pitcher plants-- maybe the arrangement was purely decorative and not really a permanent living situation?